I woke up this morning with a heaviness I haven`t felt for a really long time. It was a feeling of dread. I have been planning to share through the Capture Your Grief photo project for months. And yet this morning, I felt hesitant. After much reflection today, I realized the feeling I was experiencing was a strong protective instinct. I want to protect my lovely daughter from a world that does not understand her importance. I want to shield her from people who will look at her as just a dead baby or worse, a fetus gone wrong. As parents, we would do anything we could to protect our children from hurtful words and actions. Yet, just as I am learning with my living children, I cannot protect them from all the world`s hurts. Try as we may to insulate their little spirits, there will still be those who bruise them, purposely or unknowingly. I can only do my best to equip them with confidence in who they are and what they are. And, I can pray. So, I say a little prayer and confidently share my dear daughter`s identity with the world. Ava Faith Monchuk is our beautiful second child. 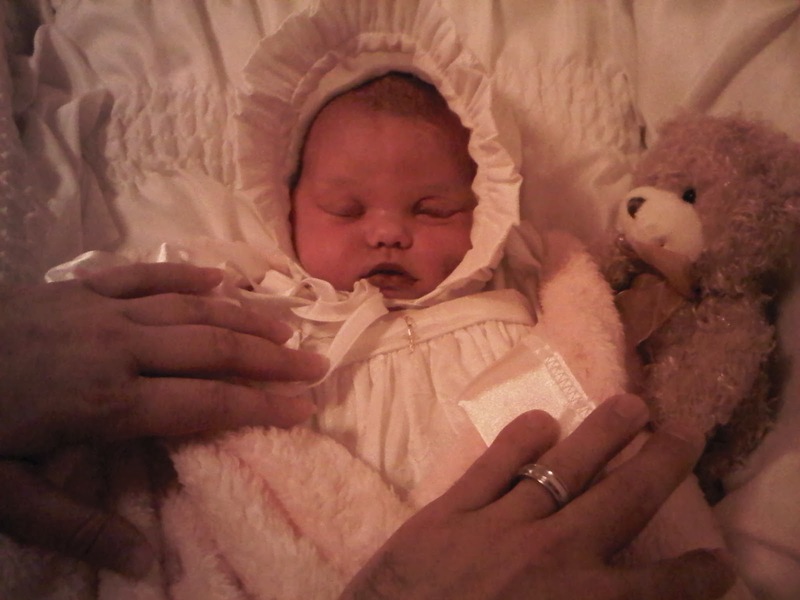 We saw her sweet face for the first time at 7:31 a.m. on June 4, 2011. She weighed 9 pounds and 3 ounces and was 21 and 3/4 inches long. Her Daddy and I thought she was such a gorgeous baby with dark, wavy hair, and a lovely little mouth. There was no part of her that was not chubby and perfect. She was an incredibly active child in utero. She hiccuped A LOT. She would sometimes move over to whatever side her brother was snuggled up to when we would read books together. A couple times she shuddered when her brother would scream loudly. I remember laughing as we watched her move my abdomen from side to side on the evening of June 2. I went to bed that night and had a great sleep. I woke up in mild early labour on June 3, which was five days past the due date we were given. As contractions intensified later that day, we went to the hospital. After several attempts to find one at the hospital, we were finally told there was no heartbeat. Our beautiful baby had died, and we would never know why. Right now, she is living out the most important part of her identity as a child of God. Her spirit is alive and beautiful in heaven and in our hearts. Even though she never took a breath, she is loved beyond description by her family and many friends. Beautiful angel baby Ava!! Hugs! She was really perfect, and taken away from us too soon. But you're right, her spirit lives in her beautiful family and all of us whose lives were touched by her. Hugs! I so get what you mean about being protective of her. I feel exactly the same about our son, Tripp. Ava is beautiful and I mean that with all of my heart. She is lovely, and I will always say she is your child, what others think is of NO consequence. Thank you, @butterflykissesfromgod. And, yes, @LeastLikelyMother, I agree that I should not worry about what others think. And yet, my heart can still bruise very easily when it comes to Ava. My emotions are still so close to the surface.